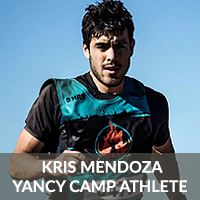 Premier OCR Athlete Kris Mendoza - Yancy Camp - Fitness for Everyone! Kris started his journey in obstacle course racing at the end of 2014, when he decided to sign up for the most extreme race he could find, World's Toughest Mudder. He limped his way to 50 miles but was hooked on OCR. After that race he started to train for OCR throughout dental school and residency. Kris began training with Yancy in preparation for the 2018 Toughest Mudder & World's Toughest Mudder race season. His most recent success came at World's Toughest Mudder 2018, finishing 1st Overall. His previous 2018 results include Toughest Mudder West (1stPlace), Toughest Mudder Midwest (2ndplace) and Toughest Mudder South (5th place). He also started to run ultramarathons, finishing 3rdin the Avalon 50K, 2ndin the Montana de Oro 50K, and 10that the NeverSummer 100K. In 2017, he capped off his season at World’s Toughest Mudder (WTM) 2017 (Team Relay-1st Place) and finished 3rd overall male with 100 miles in 2016. Kris Mendoza recently moved to Golden, Colorado following his dental anesthesiology residency at UCLA. He continues to work with multiple patient populations and enjoys serving those in need with CarePoint anesthesia.